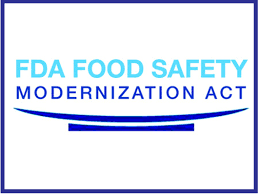 The FDA Food Safety Modernization Act (FSMA), was signed into law by President Obama on January 4, 2011. It aims to ensure the U.S. food supply is safe by shifting the focus from responding to contamination to preventing it. Through FSMA, the FDA has a legislative mandate to require comprehensive, science-based preventive controls across the food supply. Preventive Controls for Human Food: Requires that food facilities have safety plans that set forth how they will identify and minimize hazards. Final Rule. Preventive Controls for Animal Food: Establishes Current Good Manufacturing Practices and preventive controls for food for animals. Final Rule. Produce Safety: Establishes science-based standards for growing, harvesting, packing and holding produce on domestic and foreign farms. Final Rule. Foreign Supplier Verification Program: Importers will be required to verify that food imported into the United States has been produced in a manner that provides the same level of public health protection as that required of U.S. food producers. Final Rule. Third Party Certification: Establishes a program for the accreditation of third-party auditors to conduct food safety audits and issue certifications of foreign facilities producing food for humans or animals. Final Rule. Sanitary Transportation: Requires those who transport food to use sanitary practices to ensure the safety of food. Final Rule. Intentional Adulteration: Requires domestic and foreign facilities to address vulnerable processes in their operations to prevent acts intended to cause large-scale public harm. Final Rule. The Produce safety Rule establishes science-based minimum standards for the safe growing, harvesting, packing, and holding of fruits and vegetables grown for human consumption. Key requirements within the rule cover Agricultural Water, Biological Soil Amendments, Sprouts, Domesticated and Wild Animals, Worker Training and Health and Hygiene, and Equipment, Tools and Buildings. It is important to understand that the rule does not apply to everyone and that compliance dates vary depending on the key requirement and farm size. 2. The farm’s sales to qualified end-users must exceed sales to others. A qualified end-user is either the consumer of the food OR a restaurant or retail food establishment that is located in the same State or the same Indian reservation as the farm or not more than 275 miles away. A qualified exemption requires three years of sales records to support the exemption. Farms that meet the qualified exemption requirements are required to include their name and complete business address either on the label of the produce that would otherwise be covered (if a label is required under the FD&C Act and its implementing regulations) or to display the same information at the point-of-purchase. Certain other documentation is also required, although these have yet to be fully defined. Currently, we are recommending that growers follow the Good Agricultural Practices (GAPs) documentation recommendations. Large: On a rolling basis, the average annual monetary value of produce sold during the previous 3-year period is greater than $500 000. Small: On a rolling basis, the average annual monetary value of produce sold during the previous 3-year period is greater than $250 000 but no more than $500 000. Very small: On a rolling basis, the average annual monetary value of produce sold during the previous 3-year period is greater than $25 000 but no more than $250 000. This link provides a summary of key dates for all of the rules, with the Produce Rule dates listed in red. Key compliance dates for the Produce Safety Rule are summarized below. January 26, 2016: Effective date for Produce Safety Rule, including those eligible for the qualified exemption (i.e. must meet qualified exemption requirements). January 26, 2017: Sprouts-large farms. Except for certain provisions concerning written customer assurances. Additional two years to comply with these specific requirements. January 26, 2018: Sprouts-Small farms. Except for certain provisions concerning written customer assurances. Additional two years to comply with these specific requirements. January 26, 2018: Other produce-large farms. Except for certain provisions concerning written customer assurances AND certain water requirements. January 28, 2019: Sprouts-Very small farms. Except for certain provisions concerning written customer assurances. Additional two years to comply with these specific requirements. January 28, 2019: Other produce- small farms. Except for certain provisions concerning written customer assurances AND certain water requirements. January 27, 2020: Other produce-large farms. Includes all water requirements. January 27, 2020: Other produce- very small farms. Except for certain water requirements. January 26, 2021: Other produce-small farms. Includes all water requirements. January 26, 2022: Other produce-very small farms. Includes all water requirements.